Defeat the Imperialists! Defend Iraq! On February 15, more than 80,000 opponents of war on Iraq marched in Amsterdam, Netherlands, part of a worldwide series of antiwar marches. It was the biggest protest against a foreign war in Dutch history, bigger even than the largest peace demonstration during the Vietnam War (January 1973 in Utrecht). Yet simultaneous with this outpouring of antiwar sentiment, the cabinet of Christian Democratic prime minister Jan-Peter Balkenende secretly gave the green light to U.S. transport of war materiel across the Netherlands to Atlantic ports for transshipment to the Near East. Some two dozen trains were scheduled to make the trek to the sea, while roll-on roll-off ships headed down the Rhine River. As the military trains with their death cargos appeared in the Dutch countryside there was an immediate outcry. A Greenpeace team on a rubber boat tried to block a U.S. military ship in Rotterdam harbor. The government mobilized the Marechaussee (the Military Police) to guard the ports and railheads. As the American/British expeditionary force builds up for the invasion of Iraq, the Pentagon has been moving vast quantities of war materiel to the eastern Mediterranean and Persian Gulf regions. Tanks, helicopters, trucks, jeeps, armored cars and ammunition are stored at U.S. military bases in Germany, remnants of the anti-Soviet Cold War. Initially, much of the war cargo was shipped from the V Army Corps and 1st Armored Division through Belgium, but protests at the port of Antwerp were increasing. On February 16, direct action pacifists outside the town of Melsele brought a war train to a stop and chained themselves to the engine. Eleven protesters were arrested and the train went on its way, but U.S. authorities were looking for a more “secure” route. With the Austrian government nixing war transport because of the neutrality clause of its constitution and the French government balking in the UN over voting for war, they chose the Netherlands with its pliant “center-right” government. The umbrella “peace” coalition, the Platform Against the “New War,” called a national day of action against war transport for February 25. This was the anniversary of the 1941 February Strike against the Nazi deportation of Jews from the German-occupied Netherlands, traditionally a day for pious speeches by politicians (see box). For the most part, the national “action” day against war transport consisted in pacifist gestures denouncing the impending war and leafleting. In Groningen, some 300 people gathered for a torch-light vigil at the railway station, while the NCPN presented a resolution to the provincial assembly. At Schipol Airport, where charter planes with U.S. troops heading for the Near East have made stopovers, about 40 people participated in a symbolic “citizens’ inspection and sit-in. The SP (which boasts of having 40,000 members) asked questions in parliament and called vigils. Seeking a more militant form of protest, an Action Group Against Military Transport went to the headquarters of the MTMC (Military Traffic Management Command) at Capelle aan den IJssel, near Rotterdam, and chained themselves to the gates. 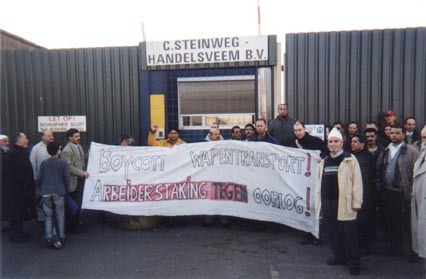 In contrast to the classless appeals to “citizens” and civil disobedience, the Verbond voor de Vierde Internationale (VVI – League for the Fourth International) has been calling since last fall to mobilize workers action to stop the war cargos. A leaflet put out by the VVI in October 2002 appealed to dock workers to boycott U.S. and Dutch warships, and to refuse to handle military goods. It also emphasized that the war preparations were linked to racist harassment and repression directed against immigrants in the Netherlands, calling on the workers movement to demand full citizenship rights for immigrants, and that the bosses were taking aim at the right to strike. In response to the news of trains with U.S. military equipment heading to Rotterdam, the VVI issued an appeal for a mobilization on February 25 that would march to the docks of the company shipping war goods to the Gulf. Leaflets of the VVI and a united-front flyer calling for the action were distributed in largely immigrant and working-class areas of South Rotterdam and the protest was announced on Radio Rijmond (in Rotterdam). “Today, February 25, instead of passively commemorating the February Strike, a first step was undertaken to carry out in practice the principle of workers solidarity with the oppressed. 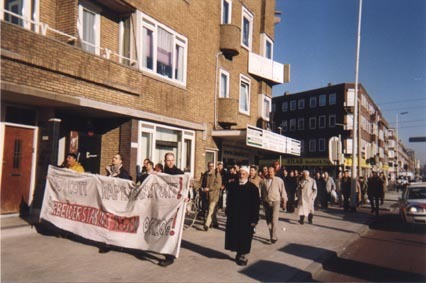 At 3 p.m. in Rotterdam-Zuid, a demonstration was held against the planned war of mass murder and pillage against Iraq, aimed at mobilizing dock and rail workers in the port of Rotterdam, with its history of wildcat strikes, to defend Iraq. “Behind a banner with the slogans, ‘Boycott Weapons Transport!’ and ‘Workers Strikes Against the War!’ some 50 participants, including Dutch, Turks, Moroccans and other immigrants, marched through the Tarwewijk area toward the port area of Waalhaven, four kilometers away. Our loud chants of ‘Defend Iraq’ and ‘Boycott the weapons’ echoed through the streets and attracted attention. 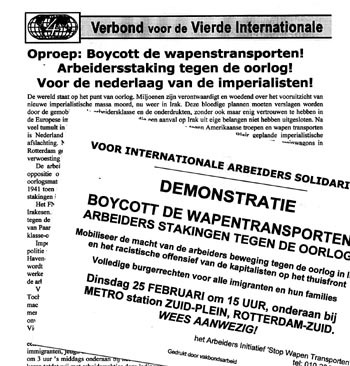 This highly necessary step toward mobilizing the workers movement, immigrants and youth against the war on Iraq was undertaken by the Arbeiders Initiatief ‘Stop Wapen Transporten’ (Workers Initiative to Stop Weapons Transport), a united front initiated on a few days’ notice by the Verbond voor de Vierde Internationale. “Upon arriving at the pier, where a production facility of the Steinweg Handelsveem (which loads and unloads U.S. war materiel) is situated, we marched toward its gate. Our way was barred by a security guard with a watchdog and three police cars. An attempt was made to speak with the Steinweg workers, but this was refused, and with our loud voices we sought to send the message of international workers solidarity over the huge green gate. “Train cars carrying an arsenal of jeeps, heavy trucks and tanks for NATO arrive daily in Rotterdam, bloody cargos of death and destruction aimed at the Iraqi people. “This must be stopped! The working class has the power to make this happen. In Scotland, railway engineers stopped a munitions train in January. This last weekend, Italian rail workers and antiwar activists blocked a train with war materiel. There are numerous reports of significant opposition among workers of the Raillion freight company to transporting war goods. But the FNV (Netherlands Labor Federation) has declared that … it has no position on the massacre of thousands upon thousands of Iraqis. “Here the union bureaucrats are following the leadership of the Labor Party (PvdA) which junked its so-called ‘opposition’ to the war in order to jump into bed with the Christian Democrats (CDA) in a rerun of the ‘Purple’ cabinets [of the ‘red’ social democrats and ‘blue’ liberals which governed the Netherlands for most of the last decade]. Down with class collaboration! While Stalinist and social-democratic reformists call to ‘Stop USA’ and look to the European imperialists, the League for the Fourth International instead calls for the defeat of all the imperialists, not only the blood-soaked U.S. and British but also the Dutch imperialists who bomb the Afghan population with their F-16s and occupy former Yugoslavia in the name of NATO. “Imperialist war at home means racist raids and police surveillance everywhere, an assault on the entire multi-national, multi-ethnic working class. Dockers and railway workers are under attack by decaying Dutch capitalism. ‘Liberalization’ of the ports and more layoffs on the railways and at the ECT container terminals are threatened. The profit motive has meant that at the ECT Maasvlakte oil terminal in Rotterdam, six workers were recently injured because of a chemical leak. Unemployment and repression are hitting all workers. The recent protests against the transport of war materiel through the Netherlands for the imperialist invasion of Iraq were called for February 25, the anniversary of the 1941 mass strike that against the World War II German occupation regime and its deportation of Jews. The “February Strike” is annually commemorated in Amsterdam, including by bourgeois politicians, but is little known outside Holland. The Netherlands were invaded by the Wehrmacht (army) on 10 May 1940. The fighting was over after six days, culminating in the German bombardment of Rotterdam the entire center of the city was destroyed, killing upwards of 30,000. Throughout 1940, Hitler’s Reichskommisar, the Austrian Nazi Seyss-Inquart, escalated anti-Semitic repression. When Jews were banned from public employment in November, students launched protests, leading to the occupation of the universities by the Nazi SD. Jews were ordered to register with the occupation authorities. In early 1941, Dutch fascists of the NSB and its paramilitary thugs of the WA staged provocations in Jewish neighborhoods, smashing windows and randomly beating up Jews. Simultaneously, the occupation government began sending thousands of Dutch workers to Germany as forced labor, leading to protests. Members of battalions of unemployed workers sent into the countryside to repair dikes rioted over their starvation pay and miserable conditions. On February 9, fighting broke out against the Germans in Amsterdam; two days later there was a pitched battle in which 20 NSB fascists were wounded and a WA member later died. In reprisal, the Germans sealed off the old Jewish quarter and machine gun nests were set up in the surrounding streets. On February 17, workers at the NSM shipbuilding company put down their tools when it was announced that a number of single workers were being sent to Germany; the strike quickly spread through the shipyards and wharves, and the measures were rescinded. On the weekend of February 22-23, German and Dutch Nazi paramilitary forces occupied the Jewish quarter and rounded up 427 young Jewish men in the Jonas Daniël Meijer Square, from where they were deported to the concentration camps of Buchenwald and Mauthausen. This manhunt sparked general indignation, and on the evening of the 23rd, district leaders of the illegal Communist Party of the Netherlands (CPN) decided to call for a strike. Even before a call was issued, by the next afternoon (February 24) workers spontaneously went into the streets, with dock workers among the first to go out. In the evening the Communist Party held a protest demonstration of several hundred at the Meijer Square. That night the CPN ran off a mimeographed manifesto calling on working people of Amsterdam to “Protest the Abominable Persecution of the Jews,” and ending with the call “Strike!!! Strike!!! Strike!! !” The next day, February 25, the whole city ground to a halt, with some 300,000 people participating in the strike. Most street cars never left the depots; the few that did were waylaid by militant workers who sent them back to the barns. Shops closed and huge crowds gathered in the streets. That evening, the Germans sent in an SS Death’s Head battalion making arrests through the night. The next morning (February 26), the strike at first seemed to be over, but in the afternoon the municipal works, shipyards, Fokker aircraft factory and railway freight yards went out. The strike spread to the Zaanstreck, Hilversum, Haarlem, Utrecht and elsewhere. After a couple of days it was suppressed by massive repression, and an attempt by the CPN to organize a strike the next month fizzled. The Nazi occupation authorities responded by arresting more than 100 workers and others thought to be “ringleaders.” Yet two years later, in April-May 1943, half a million Dutch workers again struck against the occupation regime, when the Germans threatened to intern all former Dutch soldiers. Coal miners in Limberg, Phillips electronics workers in Eindhoven, agricultural workers in Friesland stopped work. The Germans responded by shooting down almost 100 people in the streets; another 80 were executed after summary trials. The February Strike did not stop the decimation of the Jewish population: Dutch police and the Marechausee helped the SS round up thousands, holding them in the Westerbork concentration camp until they were shipped east. Of 120,000 Jews in Holland before the war, barely 20,000 managed to escape the Holocaust by obtaining false papers and going underground with the aid and protection of fellow workers and neighbors. But the February 1941 strike and April-May strikes of 1943 demonstrated the tremendous strength and courage of the working class fighting against the most overwhelming odds. These strike movements could have laid the basis for a workers uprising at the end of the war, but what was lacking was revolutionary leadership. Following the Stalinist line of support for “democratic” imperialism, the CPN pushed a nationalist anti-German policy, dropped the demand for immediate independence of Indonesia and chained the workers to the Dutch bourgeoisie through the popular-front Resistance Council (RVV), thus aiding the return of the monarchy. 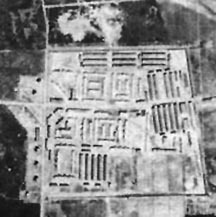 Left: Westerbork concentration camp in 1944. 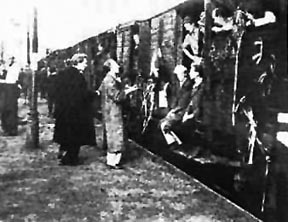 Right: Train carrying Jews from Westerbork to extermination camp at Auschwitz.